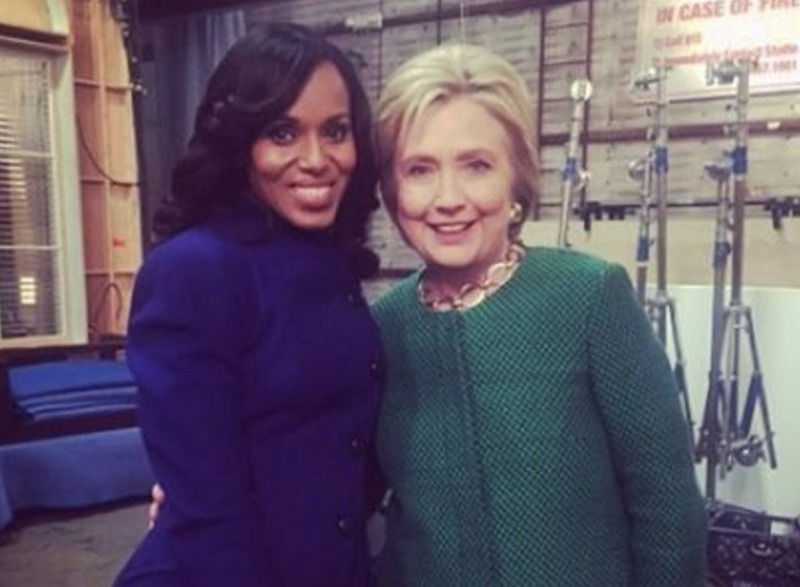 Turns out, Presidential Candidate and former Secretary of State Hillary Clinton is a huge fan of Thursday night staple TGIT, too. Especially Scandal — so Hillary, we’re with you on that. In a totally surprise appearance, Clinton stopped by the Scandal shooting set Monday night, and naturally, the entire cast and crew lost it a little bit. As Scott Foley posted to Instagram, he’s directing the episode they’re filming this week, and it looks like Clinton sat down in a director’s chair behind him to hang out, and maybe give some edit notes. Clinton also posed for pictures with our favorite Gladiator, Kerry Washington and Katie Lowes, and fictional press secretary Darby Stanchfield. Unlike with her surprise visit to Broad City last year, Clinton will not be appearing in any future episode of Scandal — and seriously, could you even imagine something like that? World’s would collide just a little too much for President Grant’s sake, so her surprise visit is perfect as it is. But more importantly, does Clinton now know the secrets of Scandal this season?? Time to ask the tough questions.